Peninsula Inn & Spa Gulfport Governor's Room - 5-bracket HDR - St. Petersburg commercial photographyDuring a DSLR photography lesson yesterday morning the student remarked that she liked St. Petersburg so much because of its old and historic buildings. 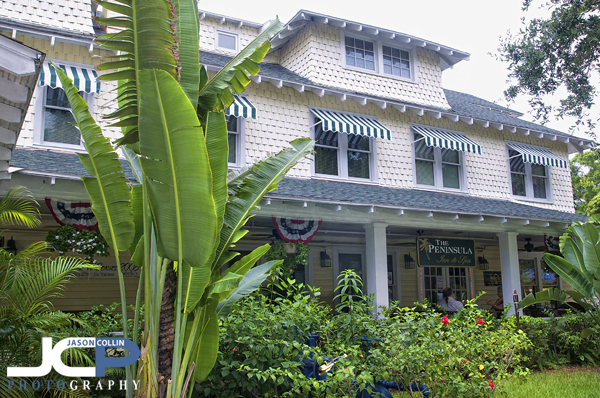 Coincidentally, I was assigned that afternoon to go photograph the Peninsula Inn & Spa in the Gulfport area of St. Pete. The inn is described as having British Colonial decor with a flare of exotic Bali, which can be seen in the above image of the Governor's Room. I certainly expected to see someone like Hemingway huddled in a corner scribbling away while taking bites of some long ago ordered sandwich. The famous Six Tables room at Peninsula Inn & Spa Gulfport - SETUP: f/8 ISO 200 6 sec exposureThe staff was very friendly and excited to talk about the history of the inn. The Six Tables room (three of which can be seen above) offers an exclusive dining experience with some of the highest rated food in the area I was told. Again, this room had a certain mysterious feeling to it, definitely not the kind of atmosphere one finds in any chain restaurant! I imagine eating in here would feel like eating in a museum or some Duke's castle in the English countryside. Veranda surrounding the Peninsula Inn & Spa Gulfport - 5-bracket HDR - St. Petersburg Commercial PhotographyThe wide veranda surrounding the inn offers another dining experience more reminiscent of Bali (and my experiences in SE Asia) with its tropical foliage at arm's reach from the tables. It is just too bad that smoking is allowed on the veranda. The Palm Lounge bar at the Peninsula Inn & Spa Gulfport - 5-bracket HDR - St. Petersburg Commercial PhotographyI used a combination of HDR shots and long exposures to photograph the various rooms of the inn. 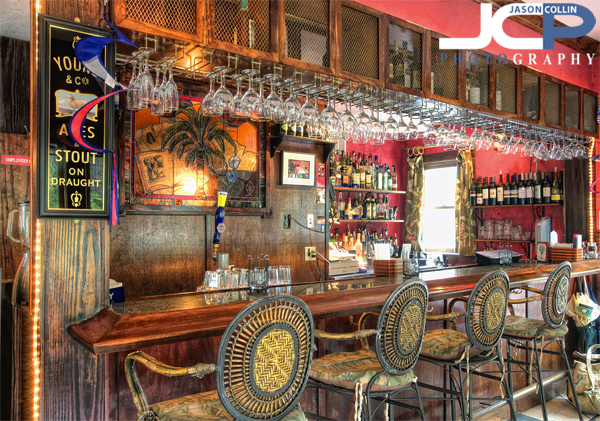 For the bar photograph above I used HDR since there was pretty good ambient light. For the dimly lit rooms like the Six Tables, the exposure on the long end of the bracket for an HDR shot would not be practical so I just used a single long exposure instead. Peninsula Inn & Spa Gulfport Florida exterior SETUP: f/8 ISO 200 1/50th tripod mounted with cable releaseThe architectural character and personable and knowledgeable staff I imagine would make for a great stay at the inn for people visiting from out of state or even out of town.